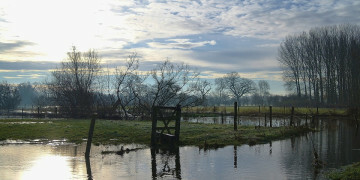 For the new season of crops about to be planted in the Northern Hemisphere, weather will be a key determinant, not just of yield, but also of molds that can turn the crops toxic. Mycotoxins are poisonous contaminants produced by naturally occurring fungi that grow on corn and other plants under particular weather conditions. They can cause disease and death in humans and animals and therefore require constant vigilance, including testing of grain at elevators, processors, feedlots, and cargo ships. Damages stemming from mycotoxins are estimated to cost US farmers and livestock producers up to $1 billion a year. Global food company Mars Inc. says it rejects up to 70% of the peanuts delivered to its factory gate in India because of aflatoxin, a virulent form of mycotoxin. 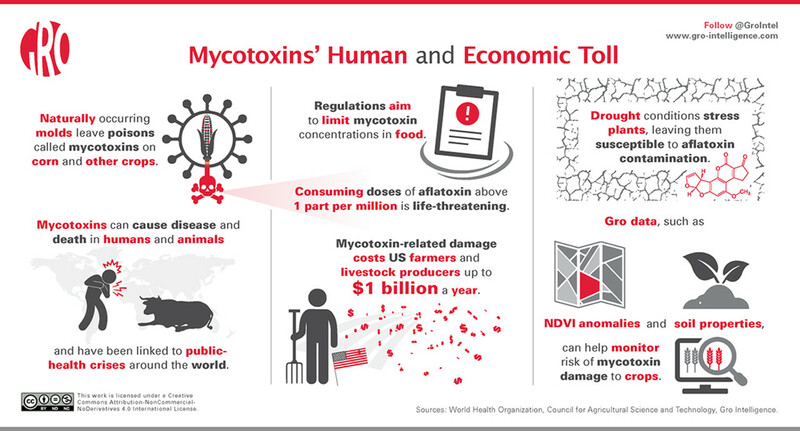 There are hundreds of mycotoxin types, but aflatoxin and vomitoxin stand out for their impact on humans and livestock. The two strains flourish under different weather conditions. A surge in vomitoxin in the eastern Corn Belt in 2016 forced Smithfield Foods to import corn from South America for its North Carolina feedlots. And aflatoxin outbreaks have been recorded in Iowa in 2003 and 2005, and across much of the Midwest in 2012. A strong relationship between particular weather conditions and mycotoxin incidence provides the opportunity to analyze the correlations and model future risk of mycotoxin outbreaks. In this Weekly Insight, we examine the scope of the mycotoxin problem for agricultural industries. We also describe which environmental data in the Gro Intelligence platform, including evapotranspiration anomalies and county-level soil properties, can best forecast areas with high mycotoxin risk. Mycotoxins have been linked to public-health crises related to corn in Tanzania in 2016, milk in Europe in 2013, peanuts in Mali in 2008, and corn in Kenya in 2004, to name only a few. They also led to pet-food recalls in the United States in 2011 and 2013. Some 4.5 billion people globally are chronically exposed to aflatoxin in their food, according to a recent article in the journal Nature co-authored by Mars’ Chief Agriculture Officer Howard-Yana Shapiro. “Even though food aflatoxin limits are set, they often go unenforced partly due to underregulated food manufacturing and reduced access to monitoring technology,” Dr. Shapiro wrote. Aflatoxin is naturally produced by an olive green, powdery mold—Aspergillus flavus and Aspergillus parasiticus are the main culprits. Corn, peanuts, and cottonseed are at the highest risk, according to the USDA. Aflatoxin is a powerful carcinogen in both humans and animals. The World Health Organization says large doses consumed in food at or above 1 mg/kg (equal to 1 part per million) are suspected of causing life-threatening aflatoxicosis in humans. When consumed daily over several weeks, much smaller doses are deadly. In livestock, aflatoxin reduces productivity and animal weight gain. Poultry are often considered the most susceptible species. In dairy cows, 1% to 2% of consumed aflatoxin is passed into milk, so aflatoxin levels in their feed must be kept below 20 parts per billion (ppb) to keep milk at levels below the 0.5 ppb level considered safe for human consumption. Aflatoxin levels are also often concentrated in processed products, such as distillers dried grains, a byproduct of ethanol production that is used for animal feed. Vomitoxin, also called deoxynivalenol, is produced by the fungus Fusarium, which shows up as reddish mold on corn, and on wheat as fusarium head blight or scab. The toxin can cause vomiting and nausea in humans, and at higher levels can affect the nervous system. In livestock, it causes mouth and throat irritation in addition to gastrointestinal issues. 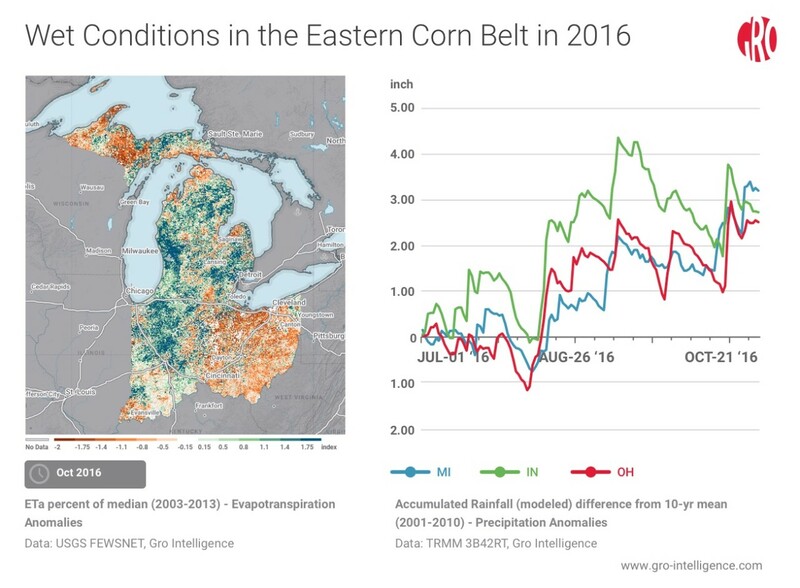 Wet conditions across the eastern Corn Belt states of Indiana, Michigan, and Ohio led to high vomitoxin contamination in the 2016 corn crop. Smithfield Foods was forced to import South American corn to meet its feed needs. The map on the left shows significantly above-normal evapotranspiration continued into October in Indiana and Michigan. The chart on the right shows accumulated rainfall versus normal in the states from July to October. The severe health and economic impacts that mycotoxins can have has led to an increase in worldwide regulation to limit mycotoxin concentrations in the food supply and to expand testing. To assure food safety and meet US Food and Drug Administration guidelines, elevators and processors that purchase grain from farmers test for toxins when grain is delivered. Any grain found to have elevated mycotoxin levels must be sequestered and off-loaded. There is no FDA-approved method to detoxify corn containing aflatoxin. The FDA has established “action levels” for aflatoxin concentration. While they do not mandate testing, these "action levels" establish the concentration at which the FDA has scientific data to support regulatory or court action. The level is 0.5 part per billion (ppb) for milk for human consumption and 20 ppb for other foods. “Action levels” for animals range from 20 ppb to 300 ppb, as animals process the toxin differently. The US requires all corn exports to be tested for aflatoxin, and concentrations over 20 ppb can’t be exported unless other strict conditions are met. 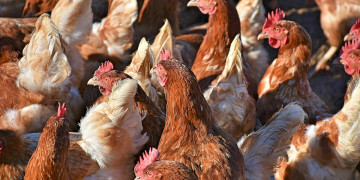 The FDA doesn’t allow blending of high-aflatoxin feed with uncontaminated product to reduce the concentration of the toxin, though sometimes exceptions are made. In 2003, 2005, and 2012, the FDA allowed blending under certain circumstances at the request of the Iowa Department of Agriculture. Vomitoxin contamination is more prevalent than that of aflatoxin, but health impacts occur at much higher concentrations. As such, the FDA has established “advisory levels” for vomitoxin in grains, which serve as industry guidelines. The FDA reserves the right to take regulatory action, but this isn’t the intended purpose of these levels. For human consumption, finished wheat products shouldn’t have a vomitoxin level in excess of 1 part per million. For animal feed, the maximum level ranges from 5 ppm to 10 ppm. Since 2013, the Chicago Board of Trade doesn’t allow vomitoxin levels in excess of 3 ppm in wheat delivered to the exchange. Levels between 2 ppm and 3 ppm receive a discount of 20 cents per bushel. Vomitoxin testing is not required for grain exports. Drought hit Iowa in both 2003 and 2005, bringing high aflatoxin contamination and forcing the state’s Department of Agriculture to petition the FDA to allow corn blending to reduce concentration of the toxin. The chart on the left shows low evapotranspiration in Iowa during the corn grain-filling stage in August 2003. The chart on the right shows the accumulated rainfall deficit in the state between July and September 2003. Fungus growth and toxin contamination can occur in the field or in storage, but field infection is considered the cause of the most impact. Infection in storage is most often linked to high moisture levels and crops that have been inadequately dried before storage. In the field, Aspergillus and Fusarium, the fungi responsible for aflatoxin and vomitoxin, respectively, thrive under different conditions, and these can provide clues to enable building predictive models of mycotoxin risk. Plants are most susceptible to Aspergillus under drought conditions. High temperatures and inadequate moisture during grain-fill leave the plants vulnerable while the Aspergillus mold is able to flourish. Later in the season, if precipitation levels increase and humidity is high, the problem can be exacerbated. 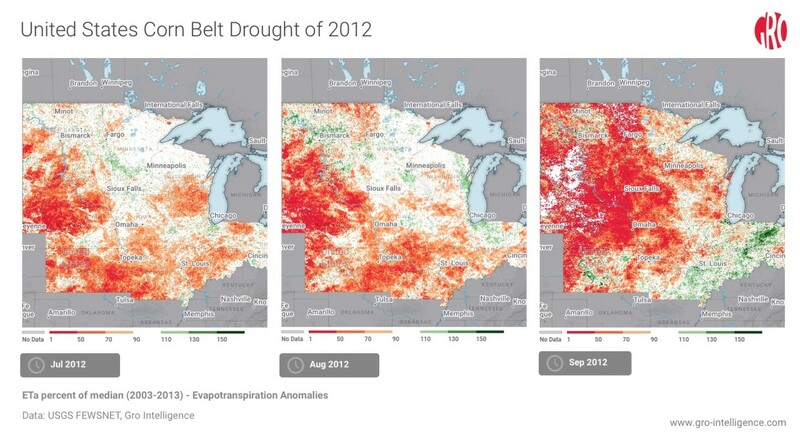 A major, persistent drought took hold of nearly the entire US Corn Belt in 2012. The national corn yield dropped to near two-decade lows, and aflatoxin contamination abounded. 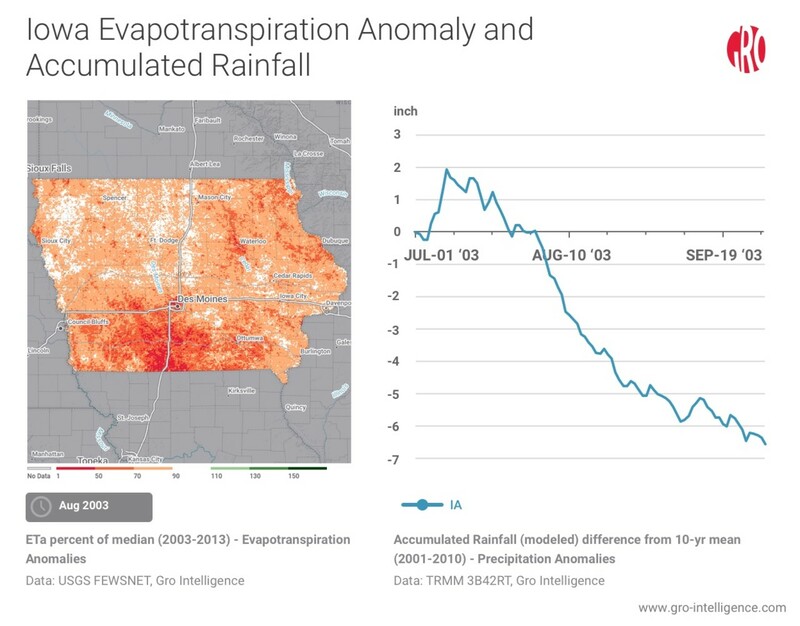 The charts above show evapotranspiration as a percentage of normal across the Corn Belt in July, August, and September. Fusarium, which produces vomitoxin, thrives under wet conditions, with cool to moderate temperatures. During corn silking, Fusarium travels down the corn silks, and high moisture and a late harvest increase the risk for vomitoxin contamination. In 1993, cool and wet conditions in the upper US Midwest led to high vomitoxin levels in the hard red spring wheat crop. Affected farmers saw such large discounts on the value of their crops that year that the government investigated concerns about improper price distortions but found no evidence. Extremely wet conditions in North Dakota in 1993 led to high vomitoxin levels and heavily discounted crop values in the state. 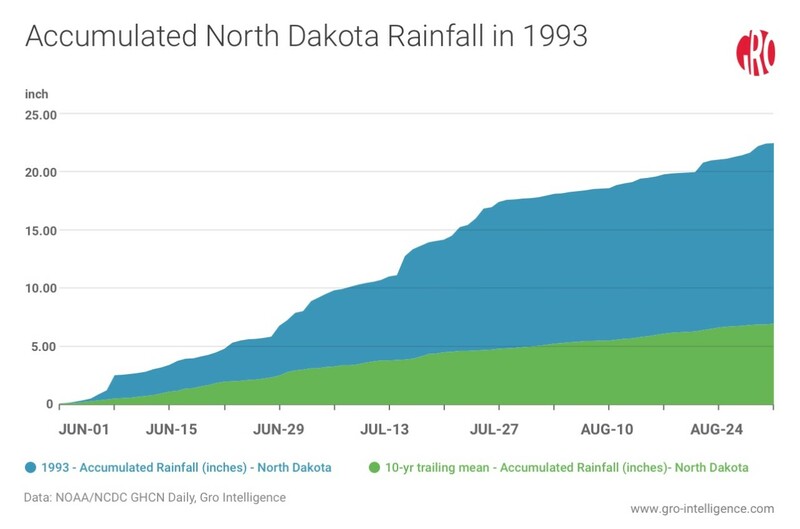 The chart above shows accumulated rainfall between June and August in North Dakota in both 1993 and the previous 10-year period. Data available in the Gro Intelligence platform allows users to monitor weather conditions and environmental factors that increase or decrease the risk of infection from mycotoxin-producing molds. Academic studies looking for such correlations in the past have been limited in scope and region, partly due to the difficulty of processing large amounts of geospatial data and modeling complex relationships. Gro has aggregated numerous global pixel-level data sets to county level. With this pre-computed data, users can create machine-learning algorithm-based models to estimate risk. For example, with historic mycotoxin occurrence rates, geospatial data on evapotranspiration and NDVI could be coupled in a model with soil-property data recently added to the platform and elevation data. Evapotranspiration and NDVI provide information on current weather conditions and vegetative health. Soil properties indicate the ability for crops to receive needed moisture, and elevation can help elucidate areas prone to flooding. Other variables such as temperature, precipitation, soil moisture, and crop calendars may prove predictive. Gro’s successful corn yield model applied machine-learning techniques to a mass of chosen data sets to estimate county-level yields. The model explains over 80% of the county-level yield variation. That methodology is publicly available, and a similar strategy can be applied to mycotoxin-incidence modeling. Mycotoxin contamination has the potential to exact a heavy toll on public health and the agricultural economy. Increased regulation worldwide has brought more crop testing and scrutiny and helps to reduce the risk of human exposure. Building predictive models for mycotoxin risk can be an aid to controlling its cost and dangers. Real-time data provides the potential to monitor crops during the growing season, allowing producers to take preventive action and end users to secure alternative sourcing. Climate change has already brought warmer weather to the Upper Midwest and Canada, and increased outbreaks of aflatoxin may follow suit. New means of containing the fungi responsible for the contamination will need to be developed, as fungi have been observed to be able to develop resistance to fungicides. The dangers these mycotoxins present to human and animal health demand vigilance by industry and public-health officials.